Are you ready to tackle your next biggest goal of 2019?! Or do you need a little sparkly + no nonsense boost to help you keep the momentum of you achieving your big New Year’s goal? Join my next FREE Mindful Living Masterclass – Nine To Shine Mindset Challenge! I teach each of my students a proven daily roadmap to help them de-stress for success. In 9 days with 9 small, actionable steps you will learn how to make a massive and positive impact in your life, family, and career. Register for my next FREE Mindful Living Masterclass + get your free Nine To Shine digital resource above. The next free masterclass will begin on May 6, 2019 – May 14, 2019. 1. FREE 9-step digital resource to help you de-stress for success. 2. 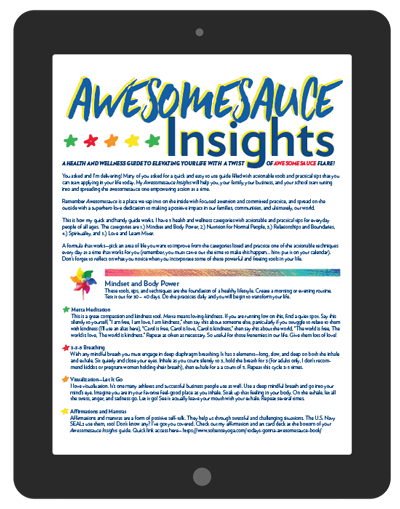 FREE digital resource journal. 3. Instagram and Facebook Live broadcasts each day. 4. Exclusive membership in my private Facebook Group, Today’s Gonna Be Awesomesauce. 5. Exclusive daily e-mails packed with insight, information, and inspiration (only for my Nine To Shine students). 6. A strong mindset to help you tackle your (next) most important goal for 2019! 7. Me as your sparkly, no nonsense guide and teacher. You do not have to be active on social media (Facebook + Instagram) to participate in the Nine To Shine Challenge. Though participating in my private Facebook Group, Today’s Gonna Be Awesomesauce,can build a strong sense of community to help you tackle your next big 2019 goal, it’s not a requirement, but it is strongly recommended. If you are not on and/or active on Facebook + Instagram, don’t despair as I will be sending out daily e-mails to my challenge participants only to help you stay inspired to meet your next biggest 2019 goal with success. 1.) How is this different from the Nine To Shine Challenge in January? Answer: Some aspects will be similar (mainly the roadmap), but you will receive a new (free) journal resource we will use during the May challenge. The daily e-mails will also be new touching on different aspects of the roadmap to help you de-stress for success. Also, the live video will always be new (diving deeper into the material) and hopefully sparkly refreshing, just like my sparkling dabbing unicorn! 2.) Why should I participate again if I already did the January challenge? Answer: Continued support is necessary for success! There’s a lot to cover and put into practice. I can’t possibly cover every detail in 9 days and you can’t possibly think of every question you want to ask. Practice brings questions. And, it’s a great start to get you moving in the right direction. Plus, your most important goal likely extends beyond the 9-day challenge and you will likely have more goals you want to tackle. It’s like reading your favorite book again with a fresh new pair of sparkly eyes. 3.) How can I continue to receive support prior to the May Nine To Shine Mindset Challenge? Answer: I’m going on IG and FB Live every Friday at 9 a.m. Come prepared with questions, comments, thoughts and, roadblocks and successes to share! Plus, I send weekly blog postings packed with useful and practical information. And, well…I’m working on something else. Stay tuned! You are not gonna want to miss when I announce my new platform to give you morefun, practical, and relatable (and digitally accessible) mindfully-infused information to positively impact your life! 4.) How do I fit in the time for this again? Answer: If you want your life to work FOR YOU and not against you, you will make the time! Anything is possible with intention. “It’s amazing what you can learn about yourself, and accomplish, in nine short days. The challenge ended a week ago, though it’s not ‘over’ as I see it working for me each and every day. In my world, setting and (maybe) achieving goals/getting things done prior to Nine to Shine was a black/white, yes/no, succeed/fail type of process. After Nine to Shine, I see more clearly the direct relationship between morning routines, feeling strong, igniting creativity, asking with clarity, spreading love, broadening of perspective, and setting very specific, narrow goals and action steps to achieve and accomplish ANYTHING and EVERYTHING. My current goal is to write on a regular basis in my blog. Previously, other than writing if it happened to be convenient when inspiration struck, (which was usually never) I had no plan and writing always fell by the wayside. I now have tools that fuel me on a daily basis, I have a structure, and ways (I’ve already seen in action) to get past the roadblocks. I have a clean, inspiring space to write. I have a notebook with ideas so that I can remember my inspirations and write on a schedule. I get focused every day. Read more about my life coaching, private lessons, and pricing here.